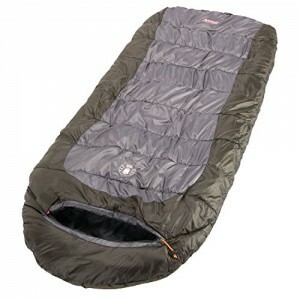 The Coleman Big Basin Extreme-Weather Hybrid Sleeping Bag is made to keep you warm in temperatures as low as 0 Fahrenheit. For less intense nights, unzipping the bottom will provide more ventilation. It has 72 ounces of ColeTherm insulation for the best heat retention. Other features include a double-batt, offset quilt construction, a semi-sculpted hood to keep your head warm, an insulated chest baffle, and a fleece foot section for your toes. Checkout out the video review below and pick up the Big Basin at this special price today!